Home › New Content › New Content from Nyssa, OR! New Content from Nyssa, OR! This summer, thanks to the generosity from the Friends of the Nyssa Library, Oregon Digital Newspaper Program was able to add new content from Nyssa, Oregon. This new content makes available the Nyssa Gate City Journal during an interesting time span we usually don’t see on the Historic Oregon Newspapers website, from 1937 to 1953! This span of the Nyssa Gate City Journal covers life in Nyssa through the last of the Great Depression, WW2, and post-war American life. More locally specific, this selection chronicles the introduction of sugar beets to Nyssa’s agricultural economy, a crop that quickly became the foundation upon which the far eastern Oregon town came to survive on. The start of our available issues of the Nyssa Gate City Journal could not be timelier for they coincide with the construction of the Amalgamated Sugar Company’s factory in Nyssa. 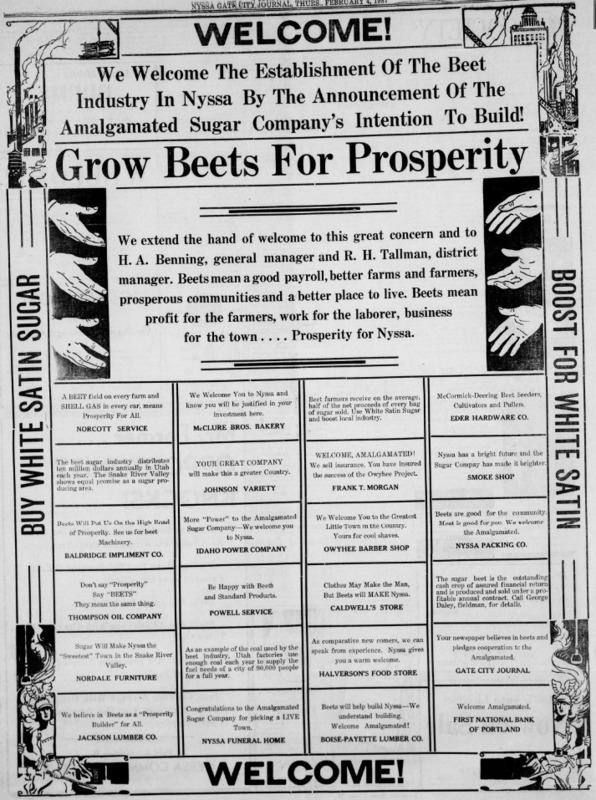 The newspaper positioned itself as a promoter of the budding industry and began to push the people of Nyssa to grow sugar beets. The Amalgamated Sugar Company did well in Nyssa; its factory remained operational until 2005. Perhaps it was due to solely the quality of the town’s surrounding land, but looking through the Nyssa Gate City Journal’s aggressive advertising campaign it seems that paper-based factors may have been equally at play. To see more of the Nyssa Gate City Journal, feel free to browse the span of issues we have digitized on our website. This title, as with all our historic newspapers, can be browsed and searched by keyword thanks to optical character recognition (OCR). In addition, content can be downloaded as a PDF or JPEG file and saved for future reference or research purposes. All of these services are free and open to the public, so don’t wait and take a look at Oregon’s historic newspapers today! ‹ New website for Historic Oregon Newspapers!